There are several sea connections from Genoa to the Eastern coast thanks to various consortiums organising boat trips from Genoa’s Ancient Port to the province’s most beautiful locations like Camogli, Portofino, San Fruttuoso and as far as Cinque Terre and from several coast towns to the Ancient Port. The medieval port’s original aspect coincided with the natural basin which today corresponds to the heart of the ancient port – Porto Antico – an area of m2 130,000 which became again part of the city after 1992, when the Genoese architect Renzo Piano designed a restoration of the area for the celebrations marking the 500th anniversary of the Discovery of America by the Genoese admiral Christopher Columbus. The famous Bigo, a panoramic elevator with its arms stretching out toward the sky, is the symbol of the ancient port; its height reaches 40 metres whilst it provides an unforgettable view of the city. The Piazza delle Feste lies at its feet: the area hosts exhibitions and concerts (from December to March it turns into an ice-skating rink). 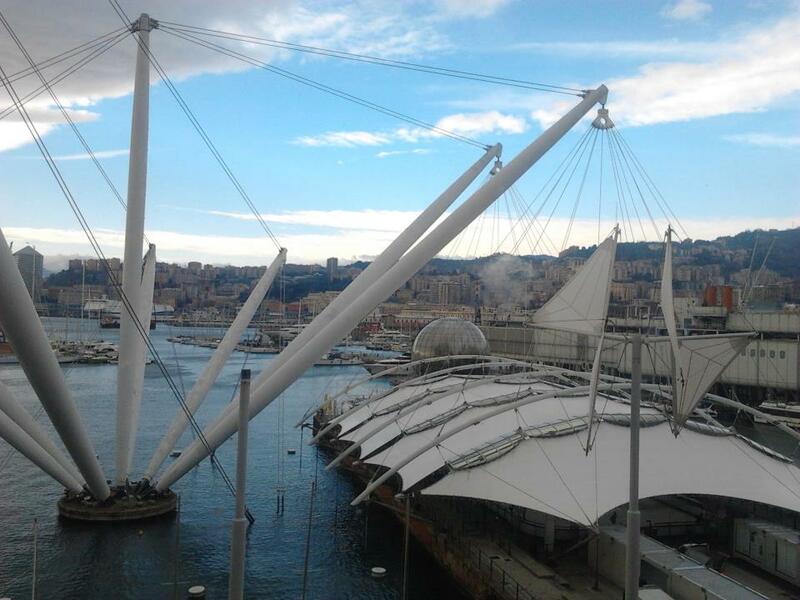 The Genoa Cricket and Football Club museum is only a footstep away. In the Molo Vecchio – old dock – area (Magazzini del Cotone) an outdoor swimming pool is located from June to September, as well as many clubs, a multiplex, Museo Luzzati, Città dei Bambini. The Aquarium of Genoa stands out in the west, as well as Galleria Atlantide, Biosfera (which hosts a miniature tropical ecosystem with different species of plants and animals) and the promenade dedicated to the memory of the Genoese singer Fabrizio De André, which leads to the barge island with its floating benches at the foot of the Lighthouse.